At The Trust for Public Land, we create parks and protect land for people – for you – ensuring healthy, livable communities for generations to come. We believe people need and deserve access to nature. We believe our work should span cities to wilderness. We believe that when we engage community, we create community. And we believe equity means everyone. Join the movement to give everyone in America access to a quality green space or park by donating today! For over a hundred and fifty years, the people of The Forks region have based their livelihood on working forests. Cold Stream Forest is now part of Maine's Public Reserve Lands system. The Trust for Public Land is joining forces with Portland Trails and the city of Portland to spearhead creation of the Portland Open Space Vision and Implementation Plan, a system-wide plan for future open-space protection and improvement. In the suburbs of Portland, Maine, residents of Cumberland and North Yarmouth use Knight's Pond and Blueberry Hill for outdoor recreation year-round. The Trust for Public Land is working to protect Maine's pristine 1,200-acre Bald Mountain Pond and its surrounding lands—a nearly 2,600-acre conservation project decades in the making. Success will ensure protection of a century-old forest and 8 miles of unspoiled waterfront from incompatible development. At the behest of the local community, The Trust for Public Land is working to protect 980 acres of forestland and create the new Bethel Community Forest. Our success will expand and diversify local recreational opportunities, unlock access to an additional 2,500 acres of public land, and empower a community through local ownership and management of the land. The Trust for Public Land is working in partnership with state agencies and maple syrup producers to protect the Big Six Forest, among the largest sources of maple syrup in the United States, with a 23,000-acre conservation easement. In 2006, TPL acquired an option on an eight-acre former lobster pound at Black Duck Cove that will be used for applied marine research, a public hatchery, a business incubator and a marine education facility. For over 80 years, the Fenn family owned more than 1,100 acres spanning 3.5 miles of shoreline along Branch Lake, the singular source of drinking water for Ellsworth, eastern Maine's largest coastal city. This 13 acres of woodland in Portland's Back Cove neighborhood has been used for decades by the public. The Trust for Public Land helped protect the land as a new park for Portland. Forest is a natural gem in an increasingly developed setting. A stone's throw away from Sugarloaf Ski Resort, Maine's most popular ski area, the Crocker Mountain property buffers more than ten miles of the Appalachian Trail, making it a prime location for second home residential development. Our projects in the Gulf of Maine Watershed range from small but essential coastal access properties to the top priorities of our National Wildlife Refuge System. 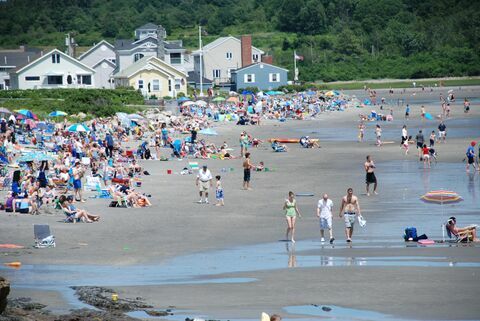 When the lone public access point to popular Higgins Beach in Scarborough was up for sale, TPL negotiated agreements with the landowners, purchased the properties, and conveyed both to the Town of Scarborough. Less than nine miles from the Atlantic Ocean, Highland Farm offers panoramic views of the upper reaches of the tidal York River and its pristine salt marshes. In 2008, a plan emerged to subdivide Highland Farm into 37 housing lots. 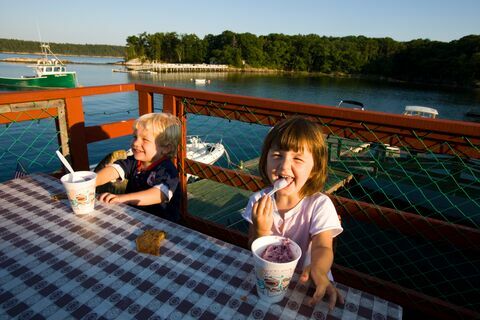 For almost 150 years, Holbrook's Wharf has helped define the community of Cundy's Harbor, Maine. When the wharf's longtime owners needed to sell, the community feared loss of waterfront access for local fishermen, and the demise of the local gathering place. residents of Hollis banded together. In 2003, TPL assisted the Appalachian Mountain Club (AMC) in purchasing the Katahdin IronWorks property as the first project in AMC's MaineWoods Initiative. Pristine and scenic Katahdin Lake has been coveted by conservationists for generations. Since 1921, when Maine Governor Percival Baxter identified the Lake as a critical piece of the Park that bears his name, this parcel of old growth forests and dramatic vistas had eluded all conservation efforts. Our Maine CommunityScape Initiative seeks to break down barriers that have traditionally kept neighboring towns and cities from working together to protect and enhance the state's "quality of place." The Trust for Public Land is currently working on several projects to protect Maine's northern forests. In March 2011, The Trust for Public Land protected two working forest properties totaling more than 7,000 acres in the Millinocket region of Maine, just east of the iconic Baxter State Park, where TPL protected Katahdin Lake in 2006. In December 2001, The Trust for Public Land helped the Department of Conservation acquire 2,468 acres as an addition to Mt. Blue State Park. We helped protect the 6,000-acre Orbeton Stream property with a conservation easement ensuring a continued source of sustainably managed and certified forest products and safeguarding public access for fishing, hiking, paddling, and hunting. Between March 2007 and June 2009, twelve Penobscot Valley communities collaborated to address land use and conservation on a regional scale. A former railroad corridor, the Portland Bayside Trail is being transformed into a greenway through Bayside, helping to redefine the public character and future of Portland, Maine. Located along 50 miles of coastline in York and Cumberland counties, the Rachel Carson National Wildlife Refuge is one of the most significant networks of conservation land in southern coastal Maine. Only four practicing members of the Shaker religion are alive today—all living at the 1,700-acre Sabbathday Lake Shaker Village, Forest and Farm located 20 miles north of Portland, Maine. The Sebago Lake Region Community Greenprint identifies the places most important to quality of life in Bridgton, Casco, Denmark, Harrison, Naples, Raymond, and Sebago. TPL helped protect land including 12 miles of frontage on Seboeis Lake and Northwest Pond and another 4.8 miles of island shoreline. By helping protect land around the south section of Seboeis Lake, The Trust for Public Land has protected 99 percent of the 45-miles of lakeshore and created an anchor to Maine's largest contiguous block of conservation land—more than half a million acres. In January 2010 TPL helped purchase of a conservation easement on the 3,363 property on Stowe Mountain, Maine. Timber Point was one of the last large, privately-owned properties along the 50-mile coastline between Cape Elizabeth and Kittery. With help from The Trust for Public Land, Maine's Department of Conservation permanently protected roughly 11,800 acres around Tumbledown Mountain in December 2002. In 2001, TPL began working with the Tumbledown Conservation Alliance and the Maine Department of Conservation in a multiyear effort to protect nearly 30,000 acres of sweeping alpine vistas, popular hiking trails, and productive forests in one of the state's most well-loved mountain areas.